1. At the end of June 2018, Beef ‘O’ Brady’s said that it had entered the second quarter poised with rapid growth momentum. The brand had undergone a number of strategic changes within the prior 12 months, including an entirely refreshed brand image, renovations to existing locations, and a revamp of the menu. Leading the charge was CEO Chris Elliott, who has focused on modernizing the concept while staying true to the company’s roots since he was hired in 2010. 2. While restaurant industry traffic has been steadily declining, down by more than 2.7 percent in Q1 of 2018, Beef ‘O’ Brady’s has tightened up its operations and launched new value offerings to make the first quarter of this year the strongest in the company’s 30-year history. The brand reported a system-wide same-store sales increase of 4.3 percent, while restaurant traffic was up 2.1 percent in the first quarter of 2018. 4. To continue strengthening its position as a franchise organization, the parent company of Beef ‘O’ Brady’s, FSC Franchise Co., has been purchasing existing franchisee-owned locations, renovating these stores, and hosting grand re-opening celebrations to encourage new customer acquisition. Between 2017 and 2018, the team purchased 16 locations throughout Florida with four additional transactions expected to close before the end of the year, making FSC Franchise Co. the largest owner of Beef ‘O’ Brady’s restaurants in the system. 6. Beef ‘O’ Brady’s has also been testing new initiatives at its corporate-owned locations, including new product roll-outs and store branding. These locations reported an increase of 8.1 percent comp sales and a 4.9 percent increase in traffic – a great sign of what’s to come for Beef ‘O’ Brady’s once the company launches these projects nationwide. 7. Although Beef ‘O’ Brady’s is working on improving its corporate locations, the company is still looking for new franchisees as its system continues to grow. At the time of the announcement, Beef ‘O’ Brady’s had locations slated to open before the end of 2018 in Panama City Beach, Florida; Beaver Dam, Kentucky; and Abingdon, Virginia. The development team is also looking for franchisees to open new locations throughout Florida, particularly in key markets such as Miami and Daytona. 10. With the recent investment from private equity firm CapitalSpring and the planned corporate acquisition of some franchisee-owned locations, Beef ‘O’ Brady’s aims to consolidate its franchise base to promote multi-unit ownership and encourage growth. In tune with this new messaging, Beef ‘O’ Brady’s aims to open a new prototype restaurant, which would include an updated kitchen to improve consistency, speed, and quality, before the end of the year. 13. Beef ‘O’ Brady’s was started in 1985 by Jim Mellody and his wife Jeanette in Brandon, Florida. Mellody had always dreamed of opening a family-friendly restaurant/neighborhood pub where friends and families could gather to enjoy good food and sports in a fun, comfortable atmosphere. 14. Mellody filled the first Beef ‘O’ Brady’s with TVs and satellite dishes so that customers could enjoy a wide array of sports. The walls of the restaurant were also covered with sports memorabilia that Mellody had collected through the years. 15. Although Mellody opened additional locations, Beef ‘O’ Brady’s did not start franchising until 1998 when Mellody sold a majority of his interest to Family Sports Concepts, Inc. Mellody retained an interest in 13 locations, which was sold when he died in 2002. 16. 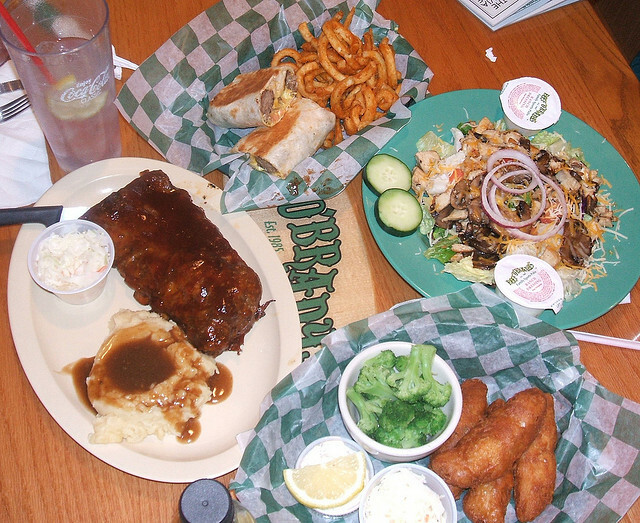 Today, Beef ‘O’ Brady’s has locations in several U.S. states, primarily in the Gulf/Southern Coast of the U.S.
17. Beef ‘O’ Brady’s did not rank on Entrepreneur’s 2018 Franchise 500 list. Please click here for detailed estimates of Beef ‘O’ Brady’s franchise costs, based on Item 7 of the company’s 2018 FDD. Please click here for detailed information on Beef ‘O’ Brady’s initial franchise fee, royalty fee, marketing fee, and other fees, based on Items 5 and 6 of the company’s 2018 FDD. The tables below contain the historical average Adjusted Gross Sales for company-owned and franchised Family Sports Pubs that were open and operating for at least 18 months before December 31 of each year for which data are shown in the charts (“Mature Family Sports Pubs”). That is, the data for 2017 includes Family Sports Pubs open on or before July 1, 2016; the data for 2016 includes Family Sports Pubs open on or before July 1, 2015; and the data for 2015 includes Family Sports Pubs open on or before July 1, 2014. This Item 19 does not include any financial information for the one Limited Service Family Sports Pub, as the franchisor is no longer offering franchises for Limited Service Family Sports Pubs. Although there were a total of 171, 184, and 196 Family Sports Pubs operating domestically as of December 31, 2017, 2016, and 2015, there were 152, 159, and 161 franchised Mature Family Sports Pubs in 2017, 2016, and 2015, respectively (“Franchised Mature Family Sports Pubs”).